Do you have a toddler headed to preschool this coming fall? If so, you might already be feeling a bit apprehensive. After all, your child will be away from you, away from home and away from all of the comforts they have at home. It is also likely you will go through some separation anxiety as well. But not to worry, this is quite normal and you will eventually get over it. Of course, at first, it might feel like your guts are being ripped out, but this too shall pass. According to experts, the gut-wrenching feeling you get when bringing Junior into preschool the first time is quite natural. What you need to be aware of is that kids adapt a whole lot faster than you might expect. And attending Kid Scholars Academy, your preschool in Sugar Land, is a new experience and a positive thing for your child. Experts also agree that preschool and daycare are very positive for your child’s growing independence, socialization and learning. So it is a good thing when they make that leap, no matter how much it hurts. 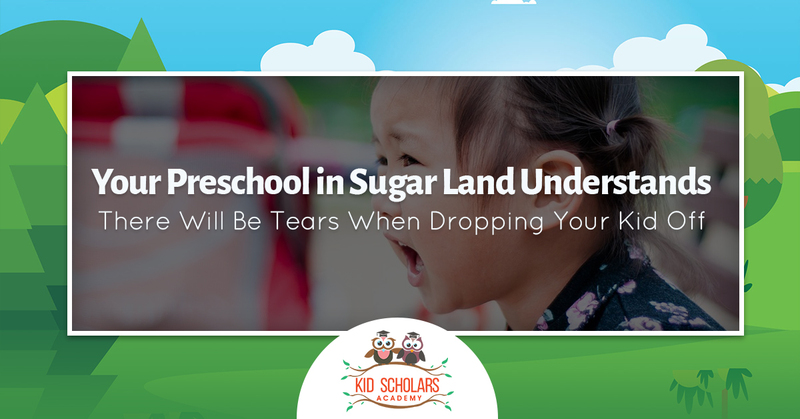 Here are a few tips that will make dropping your kid off at preschool a little easier. A goodbye ritual should be created and used every time to minimize lingering goodbyes and tears. Whatever that routine is, make sure you do it every time to get into a routine. Your routine could include a kiss on each cheek and a wave or a nose nuzzle and fist bump, but whatever you do, keep it short and to the point. Long goodbyes make it hard for both of you. Make sure you bring along something from home that will soothe Junior once you two get to preschool. This could be a blanket or stuffed animal that smells like mom or dad or smells like home. This is something that will add comfort and familiarity. If at all possible, don’t start preschool full force all at once. That is, maybe start off with half days and work your way up to full time. If the transition is gradual, it will be easier on the both of you. On the evenings before you have to drop your child at preschool, make a list of what you need to pack. Waiting until morning to pack creates panic and when you start your day with a wave of panic, you are bound to be more emotional when you drop off Junior as daycare. It is quite acceptable to check in on Junior and make sure everything is going well. Foster a rapport with your preschool provider and it makes asking questions about your fears and concerns much easier. It will take time to make the adjustment from being at home all of the time to be at preschool for a few hours a day. You will cry and it will be a sad occasion, but it will go away. Contact Kid Scholars Academy about our preschool program today.